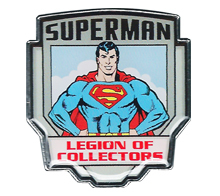 Another Superman collectible from the Warner Bros. Studio Store was this Superman “Patriotic” pen produced in 2000. The main body of the pen is decorated in red and white stripes and the cap is blue and decorated with white stars. A figure of the animated series version of Superman is attached to the cap in a dynamic flying pose. May 1, 2018 in HOUSEHOLD / OFFICE / SCHOOL. January 19, 2016 in ARTWORK / PRINTS, AUTOGRAPHS. August 26, 2015 in BOOKS / MAGAZINES.